By Mateusz Mucha and Hanna Pamuła - PhD candidate. Let's start from the beginning: what is a weighted average? 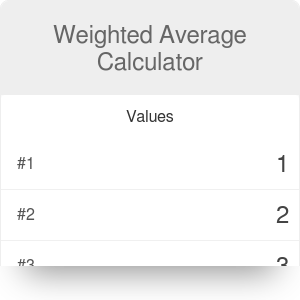 To understand how a weighted average calculator works, you must first understand what is a weighted average. Weighted average has nothing to do with weight conversion, but sometimes people confuse these two concepts. The typical average, or mean, is when all values are added and divided by the total number of values. This can be computed using our average calculator, simply by hand or using a hand-held calculator since all the values have equal weights. But what happens when values have different weights, which means that they're not equally important? Below you will see how to calculate the weighted mean using the weighted average formula. Also, you'll find examples where the weighted average method may be used - like e.g. calculation of the GPA, average grade or your final grade. Weighted average (weighted arithmetic mean) is a concept similar to standard arithmetic mean (called simply an average), but in weighted average not all elements are contributing equally to the final result. We can say that some values are more important than the others, so they are multiplied by a coefficient called the weight. where are our numbers, and weights - importance of the numbers in averaging. So, having A from an exam and C from a quiz, you'd get B as a standard average, but assuming that the exam is two times more important, you should get a B+. One type of average which is typically weighted is a grade point average. As the calculation of GPA may be sometimes tricky, we've created two dedicated tools: high school GPA and college GPA calculator - have you checked them yet? C+ for the two credit class. Sum the number of credits. 4 + 4 + 3 + 2 = 13, that was a really easy step. Let's compare this result to an average that is not weighted. Then we don't take the credits into account, and we divide the sum of grades by its total number. Notice how the weighted average changed. Sometimes it may be a really significant difference - like grade difference or even deciding about passing or not passing your course. In statistics, you will often encounter a discrete probability distribution which has values for x and their associated probabilities. Since the probabilities for each value of x will likely not all be the same, we can apply the weighted average formula. Simply multiply each x value by its probability of occurring and sum the values. A weighted average is often used to calculate the so-called weighted GPA. It's a term which rarely appears in the context of college GPA (although college GPA is computed using a weighted average method, with courses credits as weights), but is usually used for high school GPA. Let's have a closer look at this topic. The first thing which needs to be emphasized: you need to be precise, what you want to take into account during weighting - credits, course difficulty or maybe both these factors? Honors Courses most often give you additional 0.5 point (although you can find examples of schools where it's awarded with 1 point). Did you notice that it's a standard average? It's just summing all scores and dividing the result by the total number of observations (4 courses). The courses with higher credits value have better marks in our example, so the overall GPA is also higher. 4 and 9 A = (4 + 9) / 2 = 6.5 G = √(4 * 9) = √36 = 6 H = 2 / (1/4 + 1/9) ≈ 5.54 Additional info - weights. Mateusz Mucha and Hanna Pamuła - PhD candidate. Weighted Average Calculator can be embedded on your website to enrich the content you wrote and make it easier for your visitors to understand your message.